Expect hits at Russia, Iran and Syria and some tiny "balancing" western country like Iceland. Pepe Escobar calls the released Panama Papers a "limited hangout." The leak dovetails with the attempt of Transparency International to create a Global Public Beneficial Ownership Registry, which can collect ownership information from governments around the world; and with UK Prime Minister David Cameron's global anti-corruption summit next month. According to The Economist, "The Panama papers give him just the platform he needs to persuade other governments, and his own, to turn their tough talk of recent years into action." This is a reason why the "cashless society" idea is such a bad one. When no one is able to use cash, financial histories will be easily available via electronic bank records.
. . . [W]ith this Panama Paper leak and all its pre-conditioning against tax havens, people aren't realizing yet that very soon, once Negative Interest Rates and Bail-Ins are being openly discussed and prepared for implementation, the whole tax haven or tax dodger discussion in the media will quickly switch from talking about corrupt billionaires and shell companies half way around the world, and instead will be talking about something much closer to home . . . . In my strong opinion this whole thing is all part of the coming capital control war, which ties directly in with the coming transition to a biometric digital currency, the implementation of Negative Interest Rates, the rollout of large scale systemic bail-ins, and the demonization and eventual criminalization of physical assets that are outside of direct taxation control (which again would be done using the pre-conditioned guise of "tax havens", with physical precious metals and physical cash being the main targets). What we may be witnessing here is the 1% going after the 10% of people who, according to German researcher Margrit Kennedy, do not need to borrow but are "net savers." Today the remaining 90% are "all borrowed up." Either they are unwilling to borrow more or the banks are unwilling to lend to them, since they are poor credit risks. Who, then, is left to feed the machine that feeds the 1%, and more specifically the 0.001%? The power brokers at the top seem to want it all, and today that means going after those just below them on the financial food chain. The challenge is in squeezing money from people who don't need to borrow. How to legally confiscate their savings? Enter bail-ins, negative interest, all-digital currencies, and the elimination of "tax havens." Bail-ins allow the largest banks to gamble with impunity with their depositors' money. If the banks make bad bets and become insolvent, they can legally confiscate the deposits to balance their books, through an "orderly resolution" scheme of the sort mandated in the Dodd-Frank Act. Eliminating cash prevents the bank runs that these assaults on people's savings would otherwise trigger. Money that exists only as digital entries cannot be withdrawn and stored under a mattress. That could help explain those coordinated developments we've been seeing across the central-bank-controlled world, proliferating particularly after the January summit of the World Economic Forum in Davos, Switzerland, where the global elite gather to discuss the hot economic issues of the day. According to one Morgan Stanley attendee, a notable topic this year was the need for "a rapid introduction of a cashless society so that even more negative deposit interest rates could be introduced in Europe to offset likely secular stagnation." With the use of physical cash curtailed, J.P. Morgan estimates the European Central Bank could ultimately bring interest rates as low as negative 4.5%. "Secular stagnation," the official justification for negative interest, means a chronic shortfall in demand: not enough money chasing goods and services. Today virtually all money is created by banks when they make loans; and when old loans are paid off, new ones must be taken out to maintain the money supply. Central banks have traditionally dropped interest rates to stimulate this continual borrowing, but interest rates have now effectively been pushed to zero. The argument is that they can be pushed below zero -- but only if cash withdrawals, and hence bank runs, are not an option. The notion is that the economy's poor economic performance is not due to the failure of economic policy but to people hoarding their money. 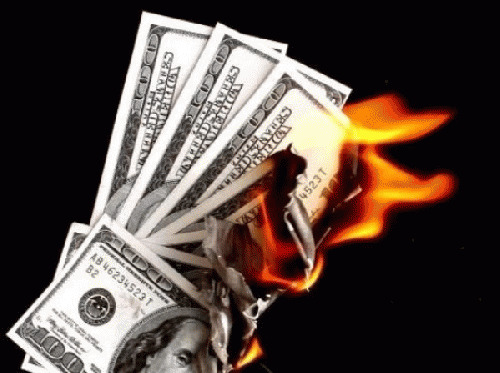 The Federal Reserve and its coterie of economists and presstitutes maintain the fiction of too much savings despite the publication of the Federal Reserve's own report that 52% of Americans cannot raise $400 without selling personal possessions or borrowing the money. In an article titled "Exposing the Hidden Agenda of Davos 2016", Zerohedge reports on a flurry of activity during and after Davos related to the push to go cashless. But stimulating demand may just be the cover story for something darker behind this orchestrated effort. It seems the War on Cash is being waged, not to stimulate the economy, but to save the lucrative private banking scheme at all costs. Quelling the riots likely to result from the mass confiscation of deposits could also underly the heightened push for a global "security state" and for those "anti-corruption" measures designed to determine where the money is and who owns it.